My life ON THE EDGE of imagination with the Proscenium Club. My name is Clayton Windatt and I have been an artist my entire life constantly imagining things and finding creative ways of expressing myself. Although this creativity flows freely and impacts on my friends and family, I have a very solitary arts practice when it comes to my imagination. I grew up drawing pictures and not showing them to people. I would often be embarrassed if someone saw what I was drawing and would hide my childhood artworks in the closet of my bedroom. As an adult, I now often work collaboratively engaging community and groups in art artions and creation processes but it is not the same for me, as working with others deals more with engagement and relationship building, not my internal imagination… until I met the extended members of the Proscenium Club and the ON THE EDGE Fringe Festival. The ON THE EDGE Fringe Festival is small multi-arts festival operating in North Bay, Ontario run by Artistic Director, Kelsey Ruhl. The Proscenium Club is an independent professional theatre troupe living and working in North Bay but touring work throughout the rural communities of Ontario. Proscenium Club is managed by Joshua Bainbridge. Josh and Kelsey are a power-couple in the arts developing, creating and producing many works together and with community. They both work primarily in theatre as actors but also direct, write and overall manage a ton of arts actions. I became friends with Josh and Kelsey years ago after meeting while making some props and set elements for a theatre production and they were both working as actors. As primarily a visual artist, I would make things at home and then drop them off at the production space not attending rehearsals. Whenever I would drop by the set to deliver my creations, I would be confronted by large groups of invasive people asking me questions and trying to get to know me. Do not get me wrong, everyone was pleasant and cheerful celebrating the things I would make but it still was human contact at a level I was not accustomed to. It reminded me of my childhood and the awkward situations I had with other children which made me feel embarrassed about my arts practice. Works were always overly celebrated which made me suspicious. Stating how talented I was and getting excited also made me suspicious. I know this sounds counterintuitive but the visual arts world rarely has this level of enthusiasm towards each other. Visual artists are well conditioned to be hyper critical of self and of peers making conversations regarding artwork often take form as debates if successful or mildly pleasant if people are bored. This combined with my own internal levels of childhood-born self doubt made it extra complicated for me. The level of encouragement and support that the actors I met within the theatre sector offered me as visual artist was akin to a very bizarre form of confidence-building therapy that I consistently questioned with scrutiny. Over time, my suspicion of these well-intending people became less and less. They wore me down with consistent kindness which, at times, I still question today. Eventually I came to know many of the actors and consider them friends interacting outside of productions and visiting to talk about all things, not just the art world. It is also important to note that the visual art scene is riddled with people that find it difficult to talk about anything other than art and the art world itself… it can feel very bleak. Among these theatre people I met Kelsey and Josh. They both function as leaders and a rally point for artists but also for a social circle of friends and families that work in the arts. Over time, I noticed a sense of community forms around them as they host barbeques, film nights, coffee meetings and all sorts of times when people gather and talk. This is not just about the connections between people as artists, although that is often discussed, it revolves around peoples lives and the world that is impacting on each person. Many artistic practices work in isolation and build ideas from critical discourse or discussion based on work that is already created. Additionally, some artistic practices form critical discourse through the interactions of people leading to the creation of art either independently or collaboratively. Through the establishment of a community environment, combinations of both take place with many people understanding many others taking knowledge and building ideas for self and for the collective. From this collective community that formed around Josh and Kelsey has come public actions. 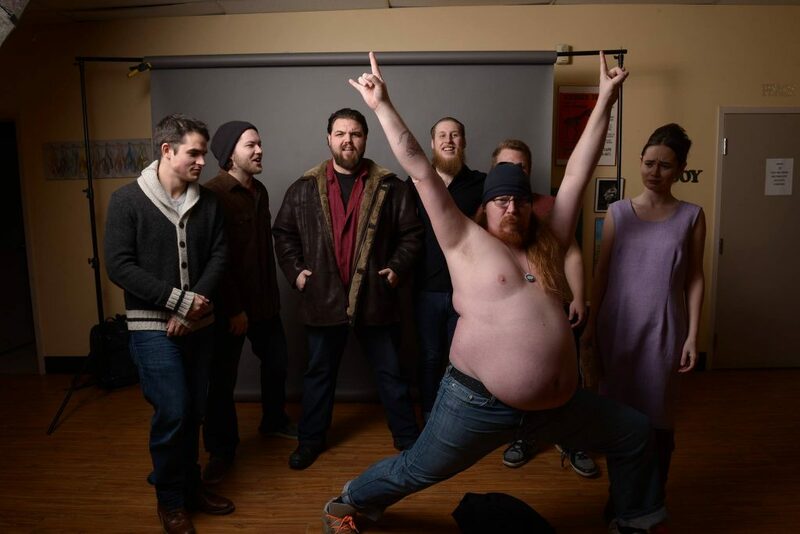 One is the formation of the ON THE EDGE Fringe Festival the began in 2014 which has grown from a small series of theatre actions in people’s basements into a major multi-arts festival taking place in North Bay each year. The other is the Proscenium Club which formed in 2016 as a theatre collective and has grown into an incubator where artists explore and develop new work. At the centre of these actions are Kelsey and Josh encouraging, supporting and celebrating. Now we get to the part that makes these groups special. Unlike many arts collectives and institutions, Proscenium Club and ON THE EDGE Fringe Festival broadcast a sense of creativity both inside their formalized projects and in the lives of the people involved. The creativity spills over into many other things making the lines between independent, community and collective very blurry. Boundaries of creative exploration become harder to distinguish as people present creative notions, writing and ideas that are not parts of formalized projects but instead just ideas that may go nowhere. People abruptly become characters they have invented as actors shapeshift in real time to suit their fancy jesting with those around them. I often receive voicemail messages on my answering machine from fictional characters making grand assumptions of my whereabouts or accusing me of avoiding them. At times, I am not sure who is actually calling me. The reason why this experience has been so life changing for me is that I have learned so much from these friends. They take things seriously at times but often open themselves to criticisms for ideas that are far from fully developed. The level of trust is very high as respect and love have become the foundation to this formed community. I used to think independently for a very long time before allowing others to hear my ideas or experience my artwork. I would build complicated understandings of context before rolling out something big. Now I openingly discuss many ideas all the time and feel that the people in my world shape my opinions so much more than in my past. These people have allowed me to grow as an artist and I am thankful for that. The ON THE EDGE Fringe Festival and the Proscenium Club theatre collective are both groups and people where I feel welcome. Where being open results in friendship and challenging creativity leads to a more challenging creative pathway. I engage with the ON THE EDGE Fringe Festival and the Proscenium Club and work towards their collective success as they have helped me to build my own creative exploration pathway. If you wish to engage in creative exploration yourself; you may find something or someone unexpected. Then you too may find the barriers between personal creativity and the realm of public fading away leading you to a better life.